A few days after the Chicago City Council approved a $1.3 million legal defense fund to help illegal immigrants facing deportation, officials in Los Angeles unveiled their version with more than seven times the money. It appears to be a growing trend of using public funds to protect those who have violated federal law. The offenders are municipalities that have long offered illegal aliens sanctuary and an array of taxpayer-funded benefits. Last week Chicago officials proudly announced their legal defense fund to help immigrants threatened with deportation. It was created to prepare for President-elect Donald Trump’s campaign promise to deport thousands of illegal immigrants. One Chicago alderman admitted he probably has illegal aliens working in his city office. The lawmaker, Carlos Ramirez-Rosa, said this in a local news report: “Donald Trump, we are sending you a message, you will not tear apart our families, we will stay together. We will defend and protect our communities.” The money to defend illegal immigrants for violating the nation’s federal statutes will come from Chicago property tax rebate funds. A few days after Chicago’s announcement, another sanctuary city more than 1,700 miles away launched a $10 million fund to help illegal immigrants dodge justice. The local newspaper called it “the region’s boldest move yet as it prepares for an expected crackdown on illegal immigration by Donald Trump.” The L.A. city attorney, whose office prosecutes crimes and represents the city in litigation, said the money will ensure that there is “more fairness and more effectiveness in the immigration system,” which, of course, is a federal and not a state matter. L.A.’s mayor said the taxpayer dollars allocated to this cause will help the region’s “most vulnerable” immigrants. The money will come from the city’s general fund, which is used for services such as street repairs, fire and police protection. I am NOT a lawyer. Nor do I play one on the Internet. However, my dusty fog of a brain remembers a few snippets from Criminal Law in college. Back in the Dark Ages (the 70’s). The words Champerty, barratry, and maintenance come to mind. However, also from the ‘esteemed Internet’ comes THIS! What have we learned from the events of this week? People pass away when they do. Something else over which we’ve no control. Carrie Fisher. Many of us feel sad because we liked her irreverent spirit, and The Star Wars character. She was way too young. And, of course, death reminds us of our own mortality. Debbie Reynolds. Debbie is of course, more of my parent’s generation. But I grew up on many of her movies, and have an special fondness for Singin’ In The Rain. The dancing. The music. The comedy. And the fact it came out the year I was born. Debbie’s demise was no surprise to me. Nature says parents should not outlive their children. Except sometimes they do. Both my (ex)wife and I did. Stating this is unpleasant is the understatement of a lifetime. I understand how Debbie’s age and grief could precipitate strokes. And I felt for her. And mourn her passing. We’re it not for blood pressure medication, I would be in stroke territory myself. And for a few years after the accident, I thought it a distinct possibility. And maybe hoped it would happen. HOLD THOSE CLOSE WHOM YOU CARE ABOUT, AND TELL THEM YOU LOVE THEM – ESPECIALLY YOUR KIDS! 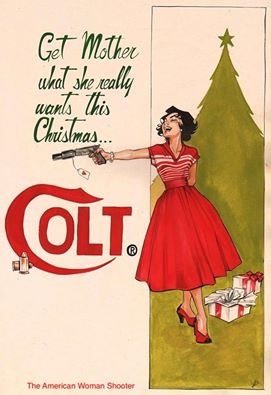 Ah, what more do you need on a long winter’s night than a crackling fire, a warm drink and a pistol that you can use to fight your way back to your rifle. That saying never seems to get old… however, without starting a full-on blizzard of angry comments, a pistol is an adequate defensive weapon in the majority of first-world scenarios. That’s not to say that I would try and dictate how others decide to protect themselves. A proper pistol outfitted with a weapon light, suppressor, optic and spare magazines is a very capable loadout in trained hands. Besides, they are easier to conceal, carry and deploy in those “oh sh*t” moments that can interrupt everyday life. 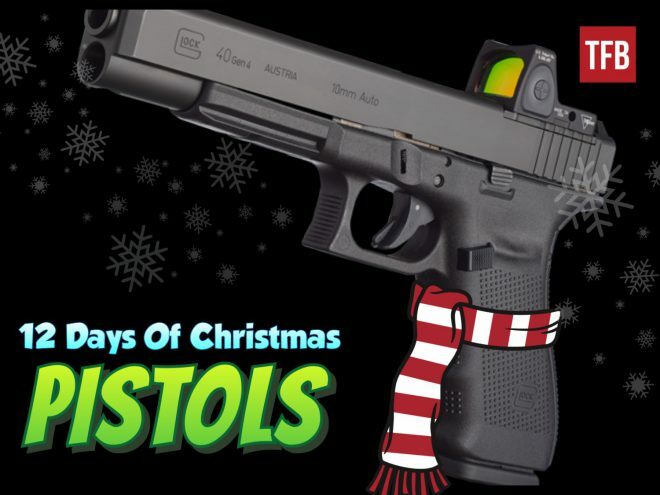 But, being the Holiday Season and all, I picked out handguns that I’d like to wake up to under the tree on Christmas morning. Not only because they can be used to defend and protect, but because they are just plain fun to shoot. As if you haven’t already spent all your money! Yeah, elderly folks don’t need to defend themselves, right? This really torques my jaw! Most of the ‘older’ folks I know have been gun owners and shooting their entire lives. To have the bureaucracy remove their rights with no due process is obscene. To all my friends and family near and far. And Best Wishes for a Safe and Healthy return for those in service to this Great Republic! Let’s hope 2017 is a better year for everyone. Christmas Eve at my niece’s last night! Okay, for anyone who cooks, not a secret at all! I don’t cook as often as I used to. This is because a combination of neuropathic foot pain and the lesser availability of funds for quality ingredients. In short, standing for any length of time is painful, and I can’t afford the fine ingredients I would like. Yes, I’m a kitchen snob. Also, my roommate gets cabin fever and likes to go out – even if it’s for ‘cheap fast food’. So, there’s that. I recently posted my standard recipe for Garlic Goldfish. A staple in my Christmas household for over 30 years. I used to use Lea & Perrins Worcestershire Sauce™ initially, because many times it was the only brand available. And certainly the most famous. But, in recent years, with my income having been cut (going on disability), I felt the need to cheapen the recipe. After all Worcestershire is Worcestershire, right? The past few years, I used whatever was on sale, sometimes a ‘name brand’ in condiments, like French’s™, other times Ralph’s Brand (my nom-de-brand for a generic product). And I found the Goldfish have suffered for it. They just didn’t taste the same. SO, after making an initial small batch using French’s this year, I bit-the-bullet and spent the extra .75 and went back to Lea & Perrins™. Now I can visit my Sister this Christmas Eve with confidence. FTC – neither Lea & Perrins, French’s, Ralph’s Brand or Pepperidge Farm Goldfish Crackers gave me anything! Go make your own! MILAN (AP) — The Tunisian man suspected of attacking a Christmas market in Berlin was killed early Friday in a shootout with police in Milan during a routine patrol, ending a Europe-wide manhunt. “The person killed, without a shadow of a doubt, is XXXX XXXX*, the suspect of the Berlin terrorist attack,” Italian Interior Minister Marco Minniti said. XXXX, who was the subject of a Europe-wide manhunt, was identified with the help of fingerprints supplied by Germany. The Islamic State group has claimed responsibility for Monday’s attack outside Berlin’s Kaiser Wilhelm Memorial Church in which a truck plowed into a crowd of shoppers, killing 12 people and injuring 56 others. XXXX served 3½ years for setting a fire at a refugee center and making threats, among other things — but Italy apparently detected no signs that he was becoming radicalized. He was repeatedly transferred among Sicilian prisons for bad conduct, with prison records saying he bullied inmates and tried to spark insurrections. Setting a fire, making threats, bad conduct, bullying inmates, tried to spark insurrections. No signs of having been radicalized, huh? What exactly does it take, Italy? PS – he was 24, and had spent at least 3 1/2 years in multiple prisons! Here’s the full AP story. Late breaking developments have emerged in the case of Georgia vs. The Department of Homeland Security. As Claire Bernish of The Free Thought Project reported on December 9th, Georgia’s secretary of State Brian Kemp penned a letter to DHS Secretary Jeh Johnson, asking the director if he was aware that DHS had attempted to hack into the server hosting the state’s voter registration database, and if so, why was DHS doing so. Today it was revealed that not only did DHS attempt to penetrate GA’s firewall once, but it had in fact attempted to do so a total of 10 times. Atlanta’s WSB-TV spoke with Kemp who said, “We need to know! We’re being told something that they think haven’t figured out yet, nobody’s really shown us how this happened.” The attacks came in February (2nd, 28th), May (23rd), and November (7th, 8th), totaling 10 in all, with the two latest attacks coming on the day before and the day of the presidential election. “It makes you wonder if somebody was trying to prove a point,” Kemp stated in his exclusive interview with WSB-TV, adding that DHS keeps changing their story. “First it was an employee in Corpus Christi, and now it’s a contractor in Georgia,” he said describing how the official DHS explanation keeps changing.